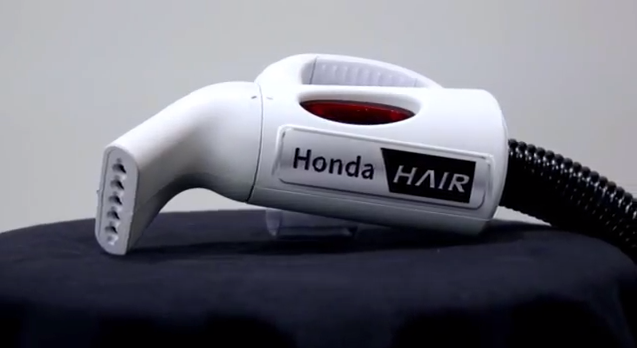 Today, Honda unveiled the first-ever mobile barbering tool for busy, cost-conscious families. The HondaHAIR will be available as a Honda Genuine Accessory that attaches to the 2014 Odyssey Touring Elite's HondaVAC to provide an efficient way to cut hair. By simply snapping the HondaHAIR into place on the Odyssey Touring Elite's standard HondaVAC vacuum, the powerful suction can fashion the perfect bob, pixie or buzz cut. Capable of creating any style cut, the HondaHAIR offers affordability and convenience and transforms the cargo space into a virtual salon on wheels--eliminating the need to trek to the stylist or barber. "We recognize that our Odyssey drivers are busier than ever, which is why we've packed the car with so many conveniences, including this HondaHAIR forward-thinking technology," said Parsley Thyme, head of Honda Public Relations.